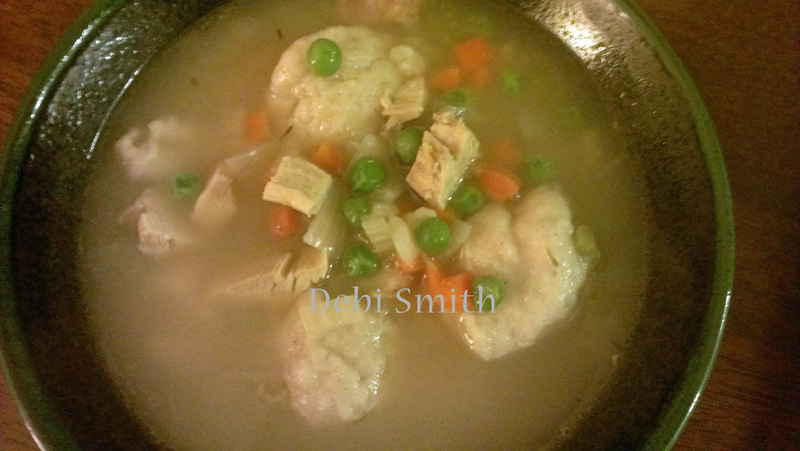 I never gave too much thought to chicken and dumplings until I moved to Kentucky. My mother rarely made it when I was growing up and it is not something you find in Hawai`i. My MIL seemed to make it often though. She did the rolled dumplings. I was used to drop dumplings. I made them a few times, but drop dumplings are easier. Less to clean up! I have worked on this recipe for the last two years trying different all-purpose gluten-free flour mixes and different measurements for the ingredients. The flour mix you use does matter. I am giving you two options: an all-purpose mix and measure your own flours. The all-purpose mix will give you a lighter, fluffier dumpling, especially if you use bacon fat. The measure your own flours will be a bit denser. You can make this over the stove or in a slow cooker. Add chicken, onion, carrots, celery, chicken broth, thyme, bay leaf, and salt to a large pot or slow cooker. Simmer for an hour over the stove or on low in a slow cooker for 4 – 5 hours. The larger your carrot pieces, the longer you want it in the slow cooker. Before the end of the cooking time, mix the flour, baking powder, and salt together in a medium mixing bowl. Add in the fat/oil and dairy-free milk. Start with 2/3 cup of the dairy-free milk and slowly mix in more if needed. You want the dough to be thick. If it is thin, you will end up with pot pie instead. At the end of the cooking time, remove the bay leaf and add the peas. Drop the dough in by tablespoon. Cover and cook for 15 minutes more on the stove or 30 minutes more in the slow cooker. If you want to thicken your soup, add a little milk to the remaining dough mix in the mixing bowl to create a slurry and add it to the pot. This entry was tagged chicken & dumplings, dairy-free, egg-free, gluten-free, peanut-free, sesame-free, soy-free, sunflower-free, yeast-free. Bookmark the permalink. Love Hodgson Mill products. Thanks for the recipe. I am going to post a link on my blog later today. Thanks.